· Easy manipulation and with low cost. · The rotation of the wire should be regularly checked. · The worn condition of beads should be regularly inspected. · The worn condition of connections & the beads near connections should be regularly checked. Change connections when it's needing. 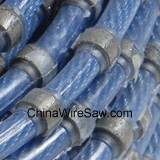 · The cable tension is set in 250-300kg(Φ4-5mm cable). 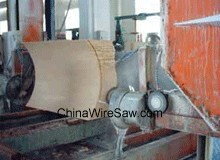 · During the sharpening of a new wire, the liner speed should be reduced 2-3 m/s from the above standard. · Water requirement is between 15-25L/min.